This page lists resources for procuring appropriate permits to conduct research under various national and subnational jurisdictions. It will be updated as additional experience and contacts are gained. Required to conduct graduate, post doctoral, and higher research in Kenya. 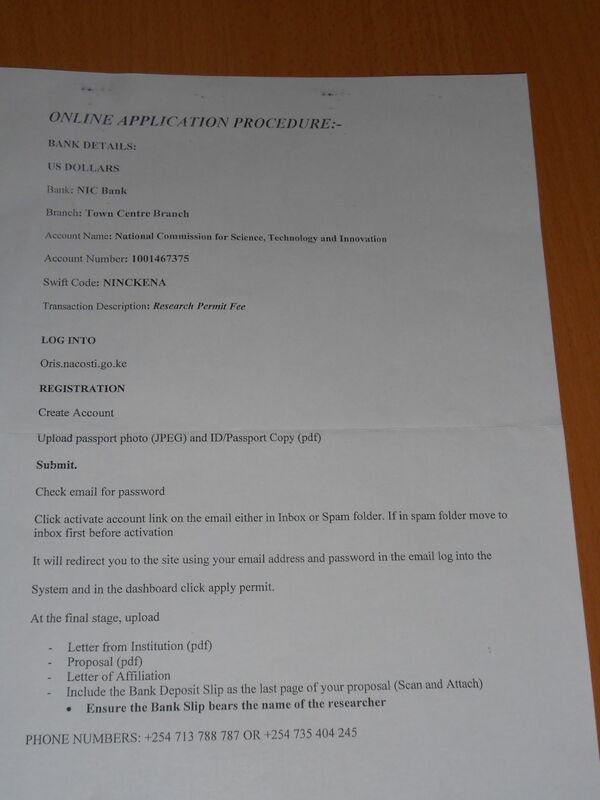 NACOSTI applications require affiliation with an appropriate research institute in Kenya. Research applications must fit within the mandate of the affiliating institution. Draft the letter on your official letterhead from your home institution and address it to the appropriate authority as suggested by your research partner(s) at the institution you are affiliating with. Note that affiliation costs a fee in American dollars (USD) and is payable to the institution. Once you have a letter of acceptance for affiliation, fill in NACOSTI Form D.
Once all forms and materials have been submitted online through the NACOSTI webpage then you should receive confirmation of receipt. NACOSTI can also be contacted through Facebook for general enquiries and aid. A completed permit can be picked up at NACOSTI in Nairobi, by courier service, and digitally. Be sure to bring copies and the original into the field and while travelling. Mainly applies to mining and mineral/rock extraction. Maps and air photographs older than 50 years old available under public domain copyright permission. Material under 50 years old require copyright permission from the Survey of Kenya. A letter of permission is required to access copyrighted Kenyan material held at Rhodes House, Bodleian Library, University of Oxford, and RCAHMS Aerial Reconnaissance Archive (Edinburgh).